These tutorials are my contribution to making the web a more useful entity. Hopefully you'll enjoy them! Have you ever wondered where all those different values for silicon Young's modulus come from? Then the "Silicon as an anisotropic mechanical material"-tutorial (a pdf-file) is for you. This four page paper reviews the crystallographic notation and shows how to calculate the silicon Young's modulus and Poisson's ratio from the stiffness tensor in any crystal direction. You may also want to download this Matlab script for your own calculations. When you miniaturize mechanics, surprising things start to happen. One result is that the mechanical noise becomes significant or even performance limiting factor as the device size is shrunk to micron scale. The "Noise in micromechanical systems"-tutorial (a pdf-file) derives Johnson-Nyguist noise for mechanical resonators. The noise performance is exemplified by analyzing the noise micromechanical accelerometer and theoretically attainable noise performance is compared to commercial devices. Modeling the micromechanical systems is a challenge as the devices often combine aspects of physics, mechanics, and electrical circuits. Electrical equivalent approach offers a simple yet very effective way to model the systems as all aspects can be analyzed in circuit domain. 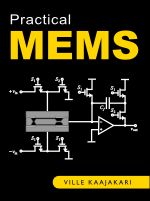 The "(Electrical) equivalent circuits for micromechanical systems"-tutorial (a pdf-file) goes through the steps of developing the electrical equivalent for a microresonator. The instability or pull-in limits the controllable displacement in electrostatic atuators. The "Pull-in voltage in electrostatic microactuators"-tutorial (a pdf-file) goes through the derivation of the pull-in voltage in electrostatical micromechanical devices. Typically, the intrinsic nonlinearities set the performance limit of microresonators. In "Nonlinearity in micromechanical resonators"-tutorial (a pdf-file), the effect of nonlinear spring forces on (micro)resonators is covered. A step-by-step perturbation analysis is carried out to analyze the microresonator power handling capacity. The effect of nonlinear springs is illustrated with a clamped-clamped beam example that shows both capacitive and mechanical nonlinearity.